The Miami Herald highlighted the announcement of Venezuelan aid to Cuba on Monday, noting that it is a project led by Interior Minister Nestor Reverol and will largely consist of construction materials intended to begin the rehabilitation of Havana’s Regla neighborhood, the hardest hit by last month’s tornado. The aid reportedly left Venezuela for the Caribbean island nation on Friday and consisted specifically of “100 tons of machinery and construction materials, including trucks, roof tiles, mortar bags, water tanks, windows and doors,” according to the Herald. “You pay love in love,” Reverol said during an event to mark the departure of the food aid on Friday, as broadcast by the leftist Latin American propaganda network Telesur. The video also shows bulldozers and other construction vehicles that will make their way to Havana. The Cuban capital city experienced its first tornado since 1940 last week, the product of high meteorological pressure. Government officials have counted six dead and over 100 injured, as well as devastating property damage throughout the center of the city, where some of the nation’s poorest residents live. In response to the disaster, the communist regime began selling tornado victims food, triggering outrage among locals who have nowhere to eat or sleep and no money to buy the government’s relief. The outrage among Cubans facing starvation if they did not pay the government for food following the tornado was confirmed this weekend as a video circulated of locals in the Regla neighborhood of Havana jeering a convoy carrying President Miguel Díaz-Canel, who had entered the area hoping to meet and greet locals for a segment on government television. Locals yelled “liars!” and “shameless!” at the government officials and forced them to eventually drive through the area without stopping. 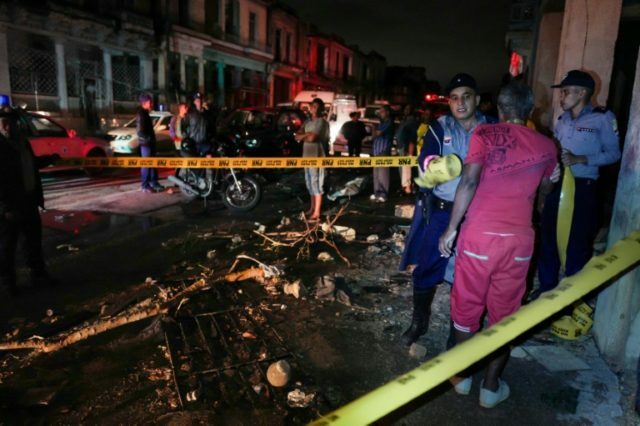 Cuban state media denied that the incident occurred, calling the video “doctored,” but Díaz-Canel himself confirmed it happened and stated that the “irritation” among those affected by the tornado was understandable. The Venezuelan socialist regime sent its aid directly to communist authorities in Cuba, making likely the probability that the regime will similarly withhold the materials and either sell them or distribute them to the most loyal regime supporters in the affected neighborhoods. Maduro’s choice to invest in rebuilding Cuba has surprised many given Venezuela’s own dire humanitarian crisis. The country’s hospitals and clinics have not maintained the medical supplies necessary to run a functional health care system for years. Doctors began asking patients to “bring your own medicine” to hospitals if possible in 2016, and many hospitals have suffered infectious outbreaks due to lack of cleaning supplies. The average Venezuelan cannot procure enough food for three meals a day, and estimates suggest that the average Venezuelan lost 24 pounds involuntarily in 2017. Venezuelan civil society groups and opposition members have demanded Maduro allow humanitarian aid to enter the country for years, with the backing of the international community, but Maduro has rejected it. Venezuela’s interim President Juan Guaidó, who took over for Maduro last month following Maduro’s fraudulent presidential election last May, has reversed course and requested global humanitarian aid. The United States, which recognizes Guaidó and not Maduro as president of the country, prepared a $20 million aid package currently parked in Colombia on the Venezuelan border. As Maduro still controls the highest ranks of the military, he has managed to keep the aid from entering the country. While accepting Venezuela’s aid, the Cuban government has resolutely backed Maduro’s rejection of aid for his people. Cuban Foreign Minister Bruno Rodríguez called Guaidó’s aid request a “grave provocation on the way to an excuse for military aggression against Venezuela,” parroting Maduro’s claim that allowing any food from the free world to enter Venezuela would trigger an armed invasion by the United States.